I’ve been intrigued by this dish for a while. Recently when I was in Boston I tried some and knew that it would be a dish Sister would love. So when she and Chris were visiting last week, it was the perfect chance to try it. We had Chris’s parents over for brunch and I think everyone really enjoyed this dish. We didn’t have any jalapenos, so I didn’t make this dish spicy. But I will definitely be making it again and want to try it with a spicy kick to it. Heat oil in a large 12″ skillet over medium-high heat. Add onions and jalapenos (if using) and cook until soft and golden brown, about 5-6 minutes. Add garlic, cumin, and paprika, stirring frequently for a few minutes until garlic is soft. Add tomatoes and about 1/2 cup water into the pan and reduce heat to medium. Simmer, stirring occasionally, until sauce thickens, about 15 minutes. Season sauce with salt. 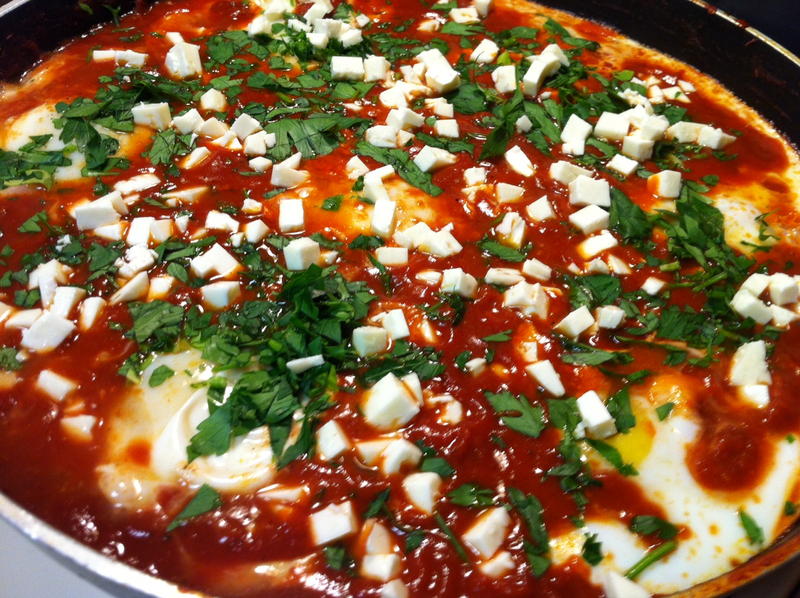 Crack eggs over the sauce so that eggs are evenly distributed across the sauce’s surface. Cover skillet and cook until yolks are set, about 5 minutes. Using a spoon baste the whites of the eggs with tomato sauce, being careful not to disturb the yolks. Sprinkle shakshuka with feta and parsley. Serve with pita for dipping.